Picbase: Is Becky 2 Belts available!? Your picbase has been changed and you've been re-added to the PDG roster. Thank you to Rhyse and Jagged for this year's PixelMania graphics! STIP: As you see here at PDG, we've all got special 'picbases', which is basically a wrestler who we portray as our fighter in the league. We cut promos in their style, using their gifs, creating a unique universe in which we do battle. For this battle royal, I want you to create a poster promoting a match between the picbases of one of PixelMania's singles matches, at the real life wrestling event of your choice. To give you an example of what I'm talking about: On this show, JeriKane is doing battle with Ara, as seen by the graphic below. Therefore, my entry for this battle royal would be a poster promoting Tyler Breeze vs. Velveteen Dream at SummerSlam. Of course it could also be any other match on this show. Jagged vs. Oggy? Create a poster advertising Asuka vs. Braun Strowman, etc. etc. STIP: During their time in NXT, Asuka and Ember Moon put on two classic matches for the WWE Universe, which saw Asuka emerge victorious both times, although just barely. Since them, both women have moved up to the main roster, and many fans are awaiting the day when these two warriors do battle with each other once again. Therefore, I want you to create a hype poster for this match, happening at SummerSlam 2019. STIP: Dolph Ziggler, one of the more polarizing figures in modern WWE history. A lot of people love him, but he also certainly has his detractors. Regardless, most everyone can agree that The Showoff can do with a change of scenery from the traditional colors of the RAW and SmackDown brands. The idea of him going to NXT has been mentioned quite a bit, and I want you fighters to bring that idea to life, by creating a poster advertising his WWE NXT debut at the TakeOver event of your choice. STIP: In WWE, we always see attempts to reach the greater mainstream audience. Whether that be through outreach in charity, appearances on local radio stations, or TV show appearance, WWE is always trying to collide with the wider mainstream. On rare occasion though, we'll also see a celebrity from outside of the WWE perform on their turf, in the ring. Recently examples include Stephen Amell performing in a tag match at SummerSlam 2015, and the insane rumor that Justin Bieber was once penciled in to tag with John Cena against The Wyatt Family at SummerSlam 2014. With that in mind, I want you to create a poster advertising the celebrity opponent of your choice against John Cena at this year's SummerSlam. STIP: As seen recently, Dean Ambrose has wrestled his last few matches for WWE on Monday Night RAW, taking multiple losses to Drew McIntyre on his way out of the company. While Dean may not be in WWE much longer, there is no doubt that he will always be popular with the pro wrestling fanbase, and will always be a hot commodity any company will be willing to pick up. That said, I want you to create a poster advertising the debut of Dean Ambrose in the pro wrestling company of your choice (besides WWE/NXT). Examples include: Impact, Ring of Honor, NJPW, etc. STIP: Ever since his return to WWE after being gone with an injury, Kevin Owens has been finishing off his opponents with a Stunner, a move of course made by famous by The Texas Rattlesnake. These two guys have talked about the usage of the move before, and it has been a hot topic among wrestling fans. Therefore, let's imagine for a moment, Stone Cold returning to the grand stage, to take back the move that brought him many titles and fame. Create a poster advertising a match between Owens and Austin for the pay-per-view event of your choice. STIP: WWE vs. NJPW, the dream angle of many pro wrestling fans these days. Both companies have some amazing wrestlers, and love to show the world what they're about in the squared circle. Fans can spend many hours debating, arguing, over which company is better. But for a moment, imagine NJPW invading WWE, a la the 'Invasion' in 2001 brought on by WCW/ECW. That storyline culminated in a big 5-on-5 match at Survivor Series that year to see which entity would live on. I want you to do that here, create a poster advertising a 5-on-5 match for Survivor Series 2019, pitting five WWE guys against five NJPW guys. STIP: As announced recently at a press conference, the legendary Jushin Thunder Liger will be retiring on January 4th, 2020 at the Tokyo Dome at Wrestle Kingdom. This news brought many emotions out of pro wrestling fans, as Jushin Liger has been wrestling for over 30 years, and is well known and respected across the globe as a veteran and innovator in the junior style that has become so prevalent in today's pro wrestling scene. This man is one of a kind, and I feel it's only right we celebrate his career with a graphic, showing off Liger in all his glory, listing some of his achievements in the process. STIP: Recently, WWE announced that they will be moving the SmackDown Live program to FOX, come this October. It's a big move, as the FOX channel reaches many households and will likely bring many new eyes to the WWE product. Traditionally, when WWE makes a big move like this, they change things up. Whether that be the titantron, the roster, or in this case, the graphics. I want you to create a custom match card, like such example, showing off a match of your choice, also including a custom made SmackDown Live logo, to show everything is truly new and fresh on the FOX channel. STIP: For many, many years now, WWE Studios has existed, producing movies one after the other to decent, but minimal fanfare. Some of their movies are good, a lot are not so good. WWE fans see a ton of potential in WWE Studios if they really tried to create stuff more appealing. Popular ideas thrown around have included a film detailing the backstory of The Wyatt Family and those characters. Another has been a buddy-cop movie idea starring Chris Jericho and Kevin Owens. Fighters, what do you think WWE could produce that would give WWE Studios some credibility to the mainstream viewing audience? Whatever your idea may be, I want you to produce an advertisement poster for your own thought up film. 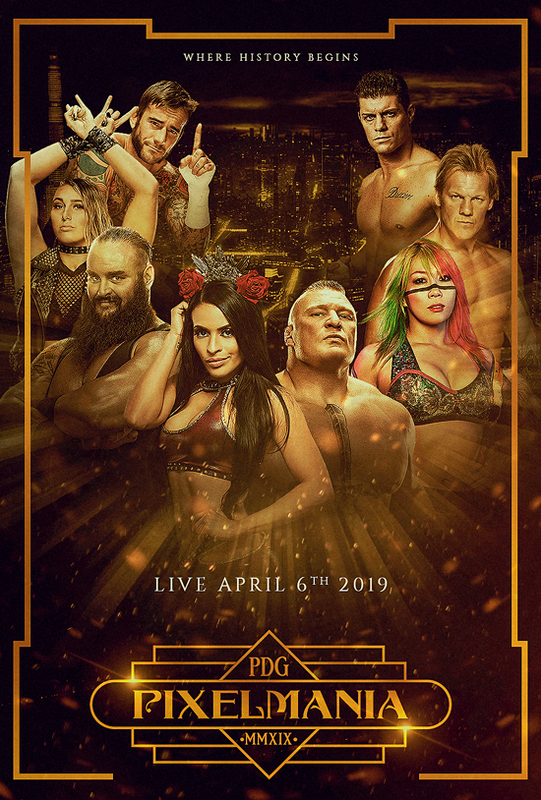 It can be anything you want, as long as your poster features one currently active WWE Superstar on it, who should also be listed as the lead actor of the film. DUE DATE: APRIL 16TH, 8PM EST. There we have it fighters, it's PixelMania 2019! I hope you guys like the card, and I hope you have fun here. I tried to make these stips a bit more special (and tougher) than usual since it's the biggest show of the year. But, I know you guys are all gonna kill it, and I'm really, really looking forward to seeing what gets made. Especially in the last three matches (Liger ). If anyone has any issues or concerns, PM me and I'll help you out.